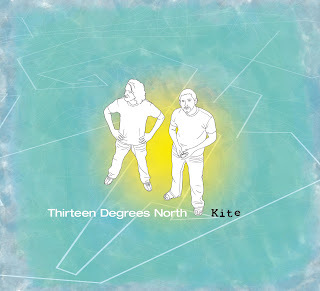 Soon to be officially released is Kite‘s sophomore disk “Thirteen Degrees North” and we managed to earn a preview and here’s not only what we thought of that – but the renewed website as well. Kite used a local company called vividview to jazz their site up and they succeeded for the most part, the design is very current and slick and I like how they have JJ and Brian as animated cartoon silhouettes yet looking very realistic at the same time. For the techies out there, it is best to view the site or check the extra features with Windows XP and have Flash Player 9 on your set up… My desktop is Windows ME and Flash 8 and neither the enhanced disc nor the website gets a full chance to properly strut their stuff that way! I ended up using my laptop with XP & 9 to get the full effects. Brian Marshall and JJ Poulter do a great job updating both the MySpace and their own personal site, far more so than Mix FM, which is ironic considering the duo have a funny morning show every Saturday on the same station as witnessed in their Mini-Documentary as found on the Enhanced CD. But what Kite’s website also needs at the moment is rather minimal – they should add in their links a way to download Flash Player Macromedia 9 for free as well as perhaps include some ringtones (some free, others to buy). I am glad they have the lyrics for both albums on the site as PDF but again, they should place a link for Adobe reader for those not so cyber-savvy. The site has three top locations for purchasing a Direct Digital Download of their album, but in reality there are 20 places to do so; CD Baby will handle overseas purchases of their actual disk that has not only the Mini-Documentary but their Firefly video. I found it amazing how ppl at Jumbies did not want to buy Kite‘s disk when they learned it was rock and yet they bopped their heads in appreciation of Masala’s rock, so it’s only good when you’re pure black in appearance? How sad and so insular! Makes you wonder how many Bajans realise Hootie in the Blowfish (Darius) is a black man? I see Mount Gay was the only sponsor disk this time and last time there was Nescafe and some others – I have heard that because Kite stood up for their performing/intellectual property rights even moreso this time that some corporate citizens got annoyed… Ensuring your financial future through residual income and insisting on those rights leads to victimisation? Only in Barbados! As for the album, it is a treasure and real fun – the Mini-Doc is worth it for me…. Watching Brian edit the tracks for what we end up enjoying, seeing JJ make googly faces between takes of the Firefly video, and the banter over one weird news item one morning on Mix 96.9 FM. JJ’s diction is better than mine ever was doing the Evening News, if you listen to “Light From A Dead Star” you get a taste of what I am stating – this is a tune where a guy is willing to commit to a relationship but she remains aloof to the point where he feels she is near yet far and thus the title of that cut. I can definitely pick up Sting and Police stylings in numerous tracks such as Beautiful Sky, this is an appropriate title for a group called Kite. It is about a jilted man recovering from a sour romance and meeting a woman of a similar condition and inviting her to share the air where they can fly together. Those two are with fairly strong airplay at the moment – Samud Ali at Love FM is no surprise as he’s originally from Mix FM and of course 96.9 has them on heavy rotation at the moment. , JJ himself admits there’s no chorus but it hooked someone at CBS and I bet they’re glad for that! The next track I see gaining ground and it already appears that way is “Breaking Up” no, not a mobile signal – rather, a parallel to such a situation within a romantic relationship… But the draw for that tune is the melodic guitar running throughout, is that Brian or Andre Donawa? Nine songs, a music-video and a slice of their lives in and out the music… Kite reeling in the fans despite corporate and racial detractors (you should have seen how the mainly black audience at the Goddards Sports Complex grooved to Kite when they hosted Riddim & Flo) – in fact, I am surprised that neither Digicel nor C&W stepped forward to try and sponsor Kite to show they can break the mold on what is Bajan music? Great article Ian. You hit all de nails pun the head. Corporate Barbados should be lining up to support these guys man, they are too good! I know this because I already unfair and pick apart the new album and this is some of the best Kite yet. Big ups to JJ and Brian and all involved in this wonderful product. Strum for your life Kite.